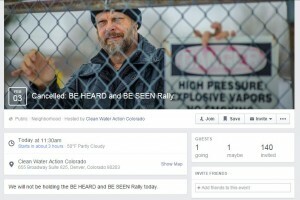 Clean Water in Colorado, an enviro group that claims to have “turned out impacted and frustrated” Coloradans for rallies at every oil and gas task force meeting, pulled the plug yesterday on a planned rally to coincide with the Denver Oil and Gas Task Force Meeting. The reason? Just one person signed up to protest. That one person who signed up was the group’s state director. The cancellation follows the group’s rally on Monday that featured just a few activists (h/t Energy-in-Depth) beyond the environmental group’s employees. And, this turnout is potentially aided by, yes, you guessed it, OnSight Public Affairs, Tom Steyer’s firm of record here in the Mile High City. Yes, the same firm that is taking money from the oil and gas industry for Governor Hickenlooper’s inauguration fete. OnSight once again seems…conflicted. Either way, we guess that means that the “impacted and frustrated” Coloradans, thankfully, are few and far between. So, we have to ask – why do we have an oil and gas task force, again?